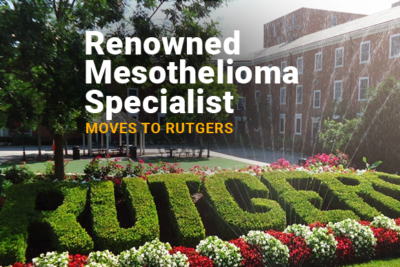 Peritoneal mesothelioma specialist Dr. H. Richard Alexander will be moving to Rutgers University in New Jersey at the end of October. Dr. Alexander is one of the country’s most renowned peritoneal mesothelioma surgeons. “As the state’s only NCI-designated Comprehensive Cancer Center, Rutgers Cancer Institute of New Jersey has an obligation to recruit the most accomplished professionals to ensure that the highest quality of care is being delivered to our patients. By adding Richard Alexander to our team, we are enabling our patients to receive additional surgical offerings that may not be afforded to them elsewhere,” Rutgers Cancer Institute Director Steven K. Libutti said. Dr. Alexander is currently the head of surgical oncology at the University of Maryland School of Medicine in Baltimore. He will be moving to Rutgers University at the end of October. At Rutgers, Dr. Alexander will become the new Chief Surgical Officer. “It is my privilege to work at an NCI-designated Comprehensive Cancer Center and an academic medical facility that are committed to conducting cutting-edge research and offering the latest treatment technologies in order to provide the best care possible for patients,” Dr. Alexander said. Dr. Alexander will also be a professor of surgery in the Division of Surgical Oncology at Rutgers Robert Wood Johnson Medical School. He looks forward to educating new and future surgeons at Rutgers. He plans to help them develop the skills and knowledge they need to be great doctors so that they can enhance the already great institute. Dr. H Richard Alexander is one of the top peritoneal mesothelioma specialists in the country. He is internationally known for his contributions to mesothelioma research. His research is focused on creating new treatments that target mesothelioma on the molecular level. He was also instrumental in proving that cytoreductive surgery wtih HIPEC is an effective and beneficial treatment for peritoneal mesothelioma patients. If you are interested in learning more about Dr. Alexander or finding the right mesothelioma specialist for you, fill out our Doctor Match form and a patient advocate with contact you with information. Internationally Recognized Surgeon Named Chief Surgical Officer at Rutgers Cancer Institute of New Jersey. Rutgers Cancer Institute of New Jersey. Retrieved from: https://cinj.org/internationally-recognized-surgeon-named-chief-surgical-officer-rutgers-cancer-institute-new-jersey. Accessed: 9/7/17. NEWS: Peritoneal Surgeon Moves to Rutgers from University of Maryland. Mesothelioma Applied Research Foundation. Retrieved from: http://blog.curemeso.org/news-peritoneal-surgeon-moves-rutgers-university-maryland/. Accessed: 9/7/17. H. Richard Alexander, MD. University of Maryland Medical Center. Retrieved from: https://findadoctor.umm.edu/details/23610/henry-h_richard-alexander-jr-cancer-general_surgery-surgical_services-baltimore-glen_burnie. Accessed: 9/13/17.